James Bond has partnered up with a ton of interesting allies over the years. Felix Leiter. Moneypenny. A harem of ladies with really unfortunate names. And now, for his 24th movie, he's teaming up with Belvedere. The vodka company announced a global partnership with Sony for Spectre earlier today, which'll mean a movie cameo for the brand as well as two special Bond-ified bottles. Above you'll see Belvedere's custom take on their "Silver Saber" bottle. On the front, they've placed a sly reference to Bond's famous opening credits, while on the back, they've got the 007 franchise logo taking up residence. But the really important thing you need to know about this guy is he lights up via a built-in LED system. (Presumably made by Q.) The extra flash might blow his cover, but at least he'll look fly as hell on the bar. 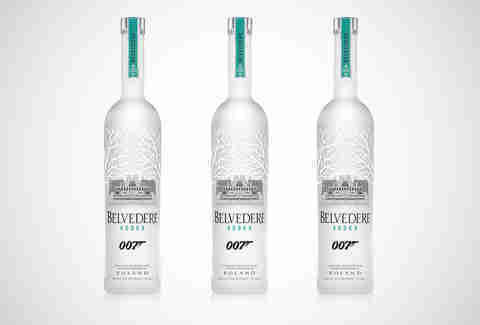 For the second bottle, Belvedere will swap out their familiar palace for the MI6 headquarters. They're also ditching the blue accents for green, in a nod to the spy agency's preferred ink color. 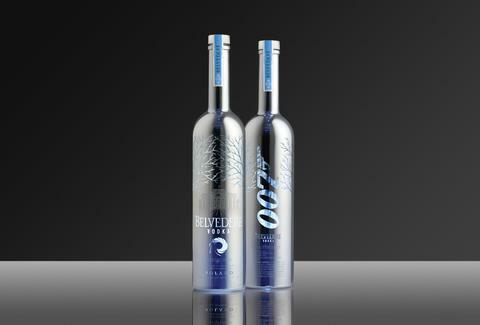 Sadly, Belvedere will only make 100 of the MI6 bottle, and you won't find them at your local liquor store. Some will be sold at charity auctions, while the rest will be gifted to some very special Bond fans. You might have better luck with the Silver Saber bottles, which will be produced in greater quantities, with "selective distribution". Belvedere's Bond campaign is set to ramp up in earnest next February, giving you another two months to perfect your martini technique. Don't let 007 down. Kristin Hunt is a Food/Drink staff writer for Thrillist, and likes to imagine an alt-universe Bond who does Fireball shots and wears tuxedo T-shirts. Follow her at @kristin_hunt.